Considering it’s probably one of the simplest games you will ever play, Divekick is going to take a lot of explaining if you aren’t familiar with fighting games and the scene that surrounds them. Created by an independent group of competitive gamers, Divekick was initially funded by a Kickstarter campaign before being picked up and completed by Iron Galaxy studios, the people behind the recent Street Fighter 3, Darkstalkers and Marvel Origins releases. Having been tested out at multiple fighting game events over several months, and receiving positive reactions wherever it went, it just remains to be seen whether or not Divekick can appeal to those not in the know and if it can justify its Â£8 price tag. So, from the beginning. 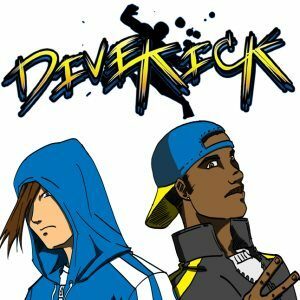 Divekick is named after and revolves around a common move in fighting games whereby a player can effectively cancel a jump in mid-fly and shoot towards the ground at various angles. Watching footage of Yun, Yang, and Rufus from Street Fighter 4 will give you a pretty good idea of Divekicks and how devastating they can be in the right hands, and how important they’ve become to fighting games in the least few years. The difference here is that Divekicks are all you have. No normal moves, no crouching, no throws, no blocks. 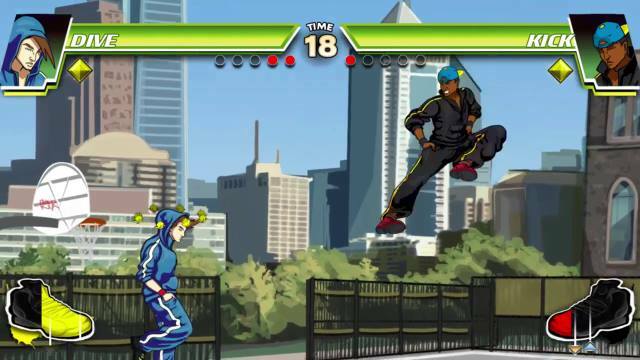 You can jump and you can divekick. Some players have slight variations and quirks that separate them from the rest of the cast, but as the game only uses 2 action buttons and no directional inputs at all, there’s only so many differences that could occur. The idea is to land a single kick on your opponent to win a round, whilst your opponent is doing the same thing. The customary health bar at the top of the screen is just for show, as one hit wins the round with matches normally lasting for best of 9 rounds. It really is the simplest concept, but the 13 available characters do help lend the game more depth and variety. And this is where Divekick may need some explaining. All the characters here are based upon or resemble characters from other fighting games or prominent members of the fighting game community. It’s highly unlikely that anyone who doesn’t commonly play these games or follow the scene will recognise or appreciate the humour behind any of these characters, as basically the whole game is one big in-joke. 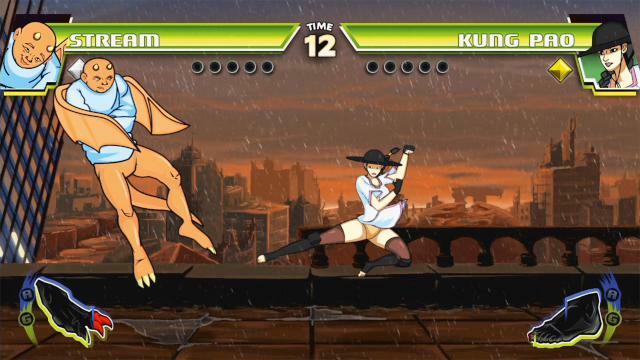 The 2 original characters, Dive and Kick, are “twins” whose inspiration comes from Street Fighter’s Yun and Yang. Mr N is a rotund whiner who plays like SF’s Rufus and is modelled on pro gamer Martin “Marn” Phan, and Kung Pao is a parody of Mortal Kombat’s resident divekicker Kung Lao. To explain all the inspirations behind all the characters would take forever, but one of the joys of this game is to spot all the parodies and in-jokes that they managed to squeeze into it. It’s a varied and funny roster, and even the most uninitiated will enjoy the strange and bizarre line up without necessarily getting the joke. Furthermore, the references aren’t just confined to the characters in the game. The gem system, a blatant parody of Street Fighter X Tekken, allows you to choose just one gem that boosts your character slightly in one area of your choice. Kick-Factor follows MvC3’s X-Factor by allowing a character a speed and ability boost when activated, and scoring a head shot will reward you with head shot bonuses, just like in erm… first person shooters. One brand new feature that is introduced is the Hold the Line mechanic that prevents potential tied games where no successful divekick is landed. When time is running out, a red line appears in the centre of the playing area and the closest player to it when time is up, wins the round. Again, it’s simple but does help raise the panic level significantly when you spot it with only 4 seconds left. The character sprites are very 2-D, and are barely animated at all. But they are well drawn, and to be honest, the style fits the game well. At no point will this ever feel cutting edge or awe-inspiring, but it does feel new, and the lack of visual bang really doesn’t matter. It’s bright, clear and feels right that a game so simple looks simple too. The sound is much better, with some funny effects and some nice character voices bringing the whole thing to life. In terms of game modes, Divekick is a little lacking. You get a story mode that is hardly Injustice, but is still probably better than SF4’s woeful efforts. And then you have online mode with both ranked and casual matches available, and although I had some trouble finding games, when I did, it ran smoothly through the GGPO system. Lastly, you have the standard versus mode, and that’s it. Now it could be argued that you don’t really need anything else, and I understand that. Versus mode is by far the best way to play and a seemingly simple game becomes a tense, scream-inducing ragefest with surprisingly deep levels of gameplay when played with the person next to you on the sofa. But does that mean you can still charge Â£8 for it? This is the quandary Divekick faces. If you have someone, anyone, to play with, face to face, I would recommend this in a heartbeat. Because of its 2 button simplicity, anybody can play this, enjoy this, and can get a pretty good grasp within 1 or 2 rounds. My 12 year old daughter, who normally can’t abide “all this fighting game rubbish”, sat and played for 45 minutes before declaring it “the best fighting game ever!”. She’s wrong of course, but the point is, once I’d shown her the 2 buttons and she’d had a quick try, she could play it and do everything I could do. That probably wouldn’t be true with, say, Persona 4 Arena. It then gets deeper as both players improve or approach the game differently, with different characters or tactics. The problem is, if you’re a single player, or relying on online for your competition, it’s going to get old much quicker. Online works great but a game like this needs you to see the whites of your opponents eyes and be able to scream, shout and curse at them as you go, and playing online just feels a little lacking. So who should invest their hard-earned money and hard-drive space to Divekick? Well if you’re a big fan of fighting games, then yes. If you are anybody with a Vita or a PS3 and a friend, then hell yes. If you are a solo player with no love of the fighting genre, this probably isn’t for you. But all-in-all, Divekick is a job well done. Having watched this game develop from a 2 character beta to a 13 character game proper, it’s been fascinating to see a willing group of fighting game fans slowly create this loving homage to the games they love. Its staggeringly simple, yet deceptively deep. It looks 15 years old, but feels as fresh as a daisy. And whilst it’s not for everyone, it’s as close to being for anyone as fighting games have ever been.